While you may not want to think about it, you're probably going to be staying in your home for the long haul and your bathroom will need to be a lot more accessible when you're reaching your golden years. According to The Times Colonist, there are some inexpensive bathroom accessories that can help you avoid an extensive renovation down the road. First you should look to your doorways - make sure that the space is wide enough to accommodate a wheelchair or a walker. This also applies to counter top heights, aisles and other spaces in your bathroom that may become cramped. When approaching your bathtub, consider a side-entry tub with an adjustable shower head that can be reached easily from a seated position. A retractable nozzle is a great choice, and you can find these products in a number of different styles and finishes to suit your interior design. Lastly, think about installing grab bars inside of your shower to make it easier to get in and out. These simple changes will pay off in the long run and make sure that you can age gracefully in your own home. 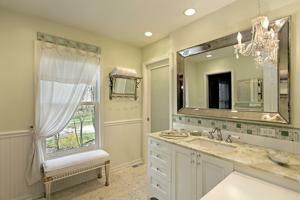 What senior living changes do you recommend for bathrooms?